← Does Your Online Presence Pass the Truth Test? 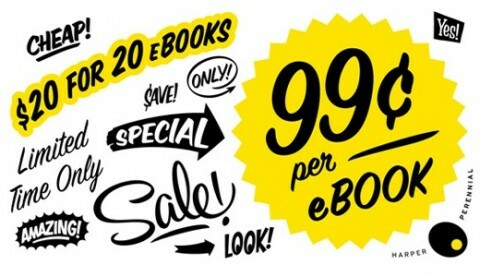 There has been a lot of discussion about how to price an e-book over the last few years. Book pricing conventions from the print world–e.g., 5 times the cost of production or standard retail price points–offer no guidance in the digital realm. e-Book prices have run the gamut from $0.99 to $9.99–and often authors offer them free as an inducement to lure readers in the hopes of future sales. This can be viewed as chaos or opportunity depending on your vantage point. The variable pricing model for e-books is bringing an old retail concept to the stodgy world of bookselling–the markdown.. Books in digital form can be priced to sell. In the bricks and mortar world of book retail, prices are fixed. The publisher has one shot at getting it right. Now e-books prices can be adjusted in response to demand, or to stimulant demand. This can be used to set the price on books. Perhaps this digital pricing freedom will someday spill over to the print world. But don’t look for that to happen any time soon. Bookstores still have an easy out for unsold stock–the hated return policy. Ship it back to the publisher at his / her expense. Since their stock is contingent, bookstores have no need to adjust pricing to manipulate demand or clear unwanted inventory. However, a good thing rarely lasts forever. Readers who get used to the pricing flexibility of e-books may one day demand the same kind of flexibility from the print booksellers. This entry was posted in open publishing, publishing strategy, publishing technology, readership strategies and tagged e-book pricing, e-books, pricing strategy. Bookmark the permalink.